Fabric glue is a fantastic tool for bonding fabrics -- until it gets somewhere it isn't supposed to be. Whoops! If you accidentally find glue where it shouldn't be, don't panic. There are ways to remove it without damaging your garment. Most fabric glue will be able to withstand cycles in your washing machine and dryer, so you'll have to employ other methods to remove it from fabric. Most types of fabric glue withstand washing cycles but will not withstand dry-cleaning solution. To remove these types of fabric glue, dry-clean the fabric several times to loosen the fabric glue's hold on the fabric. You can use a home dry-cleaning kit to do this, or take it to a local dry cleaners. You may need to clean the fabric this way several times before you remove all of the fabric glue. 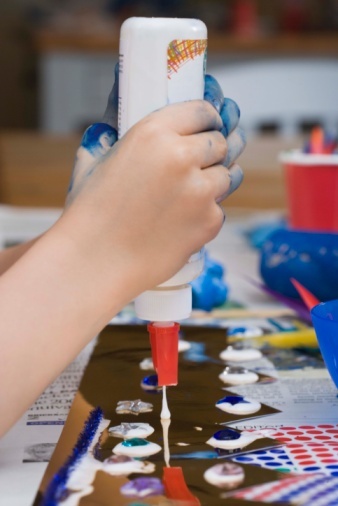 Scraping off the dried glue may be the only step needed. Use a dull knife or the edge of a plastic credit card (or a fingernail) as a scraper Wedge the scraper underneath the piece of dried glue and gently push it until it pops off. This process generally works better if the glue has set and is brittle. Steam can moisten the adhesive and may loosen it enough to pull apart fabric. A steam iron can generate enough heat to release the fibers, allowing you to separate the fabric. If there are stains or residual glue, scrape the hardened parts of the glue off, and use an old toothbrush to rub liquid laundry detergent against the weave. Hand wash or run through the washing machine on a gentle cycle. Most DIYers already know the power of baking soda when it comes to cleaning. For glue and other sticky stuff, two parts baking soda to one part coconut oil can work through adhesive. Use a toothbrush or your fingers to rub the mix against the glue. Rinse with liquid laundry detergent and wash as normal. Acetone is the active ingredient in nail polish remover, and nail polish remover can be used to remove glue from white or color-less fabric. Do not use on dyed or colored fabric, as the acetone may remove the color and ruin the garment. Use a Q-tip or cotton ball to gently dab the fabric. Wash immediately after glue is remove to avoid acetone staining. If your fabric glue dissolves by dry-cleaning, you can also use dry-cleaning solution to remove fabric glue residue from the fabric. This is especially important if the fabric glue is in a crevice of the fabric that might not be very easily accessible. To use it, apply the dry-cleaning solution directly to the fabric glue until you remove it.